Published in Boots’n All, August 2012. Original article here. The foggy city by the bay will leave you seduced by the chilled-out vibe, worn out by rolling hills, sated by fresh fusion cooking and blissed out by hazy California afternoons. San Francisco will charm you for sure but be warned: it may also claim your heart. “Other cities may surprise you, but in San Francisco you surprise yourself.” This was the bold assertion from the poster at the airport, which I read bleary-eyed after the 10-hour flight from London. San Francisco is a point on the map, I thought cynically, not a trip down the rabbit hole. Or is it? Every story you read about San Francisco, the little city perched on an earthquake-ridden peninsula in northern California, seem to suggest something magical is at work there, something above and beyond what you can expect from just any old town. Oscar Wilde put it this way: “It is an odd thing, but everyone who disappears is said to be seen at San Francisco. It must be a delightful city, and possess all the attractions of the next world.” It seems everyone who goes there will forever talk about San Francisco with a slightly dreamy look on their faces. Words fail when they try to put their finger on it, but I will take a shot and say it is the fantastically laid-back spirit, coupled with unique optimism, that gives San Francisco its unique brand of magic. Few other places can claim their people to be more friendly, more easy-going, more open-minded or indeed more colourful. This attitude is probably the city’s main attraction, but as a very close second is the art deco masterpiece that is the Golden Gate Bridge. Soaring across the bay in bright orange, this beloved landmark celebrated its 75th anniversary in May, with fireworks and crowds singing with their arms around each other: “If you’re going to San Francisco, be sure to wear some flowers in your hair.” Pedestrians can cross the three kilometre bridge, but the best views are probably from Fort Point, the spot underneath where Kim Novak met her untimely end in Hitchcock’s ‘Vertigo’. Equally spectacular views can be found from Baker Beach, where the rugged Presidio Park take over from the cityscape and makes you forget you are in an urban environment altogether. As a relatively small city, San Francisco is best explored by foot. Still, it is wise to make use of the excellent bus network to negotiate the many hills, some which have a grade as steep as more than 30%. Your legs will ache for days after your visit, down the back from walking uphill, and down the front from walking down them. And make sure you get standing room on the ubiquitous cable car, and the rest of your body will ache too as you hang on for dear life as this ancient contraption soars up and down the steepest hills of the city, with no concern for modern health and safety regulations. But whatever you do, be sure to take a jacket everywhere, even if there is no cloud in sight, and you may want to think twice about those shorts too. San Francisco is prone to afternoon fog, especially in the summer, and the notoriously unpredictable microclimates means you may well encounter all four seasons in a single day. San Francisco carries its hippie heritage through to this day, with a general penchant for kicking back and smelling the metaphorical roses. It was here the Summer of Love happened, in Haight-Ashbury in 1967, and visitors can retrace the steps of Janis Joplin, the Grateful Dead and Jefferson Airplane among tie-dyed locals still dreaming of Love-Ins. But make no mistake: this is not a city that spends its time dossing around in the park, loaded up on dubious substances; San Franciscans read more books per capita than anyone else in the US, and between them they have more university degrees and file more patent applications too. What else should we expect from the city which has the world’s best innovation incubator, Silicon Valley, on its doorstep. It is hard to go wrong when choosing sights in San Francisco, as even the biggest tourist trap, Fisherman’s Wharf, has a major redeeming feature with a pack of wild sea lions having made the pier their home. A more elusive sight is the flock of wild parrots inhabiting Telegraph Hill, but you will know it if you are near them: the little green and red bodies are constantly screeching at each other as they roam about town. While generally a very safe and friendly city, some visitors may choose to avoid the Tenderloin district, the main hangout for the city’s disproportionately large homeless population. With most hotels located downtown, visitors will find Market Street to be a reliable landmark; similarly Columbus Avenue will provide a convenient navigator up to North Beach, the Italian district. The brew at Caffe Trieste is excellent, and not only because Francis Ford Coppola allegedly wrote ‘The Godfather’ there. Sit and read a while at City Lights Bookstore, which became the epicentre of the Beat wave after owner Lawrence Ferlinghetti published Allen Ginsberg’s controversial ‘Howl’. Up the road is Chinatown, where on Stockton Street you will rarely hear English spoken as the locals go about their business. Make sure to visit Tien Hau temple, the oldest Chinese house of worship in the US, before trying the salt-and-pepper squid at Yuet Lee, which arrives to the table stacked high like a plate of crisps. It is hard to have a bad meal in San Francisco, where the residents value fresh fusion cooking and take issues such as sustainable farming and composting very seriously. Some of the best food is found in the more suburban neighbourhoods, such as Burma Superstar in the Richmond district. The queues may look off-putting but no one dreams of leaving, as soon there will be odd-sounding but mouth-watering dishes such as ‘Fermented Tea Leaf Salad’. For a more classic San Francisco dining experience head to Tadich Grill, located near the Ferry Building, which serves up big, steaming plates of seafood cioppino. The Mission is where you will find the coolest coffee shops and bars, serving local brews such as Anchor Steam and Fat Tyre, but at the heart of it all is a thriving Latino community which whips up what is called the ‘Mission Burrito’. This is a food experience like no other burrito, and the best is arguably from La Taqueria. Still, make sure you are not too full to take a stroll around the neighbourhood afterwards; the tradition of creating murals on every available surface lives proudly in the Mission. Even more so than anywhere else in the city, this is a neighbourhood bursting with colour. * Blue Bottle Coffee. San Franciscans take their coffee seriously, but they still serve it with a smile. Visit the shop in SoMa or the cart at the Ferry Building. * Ina Coolbrith Park. Do not miss this gem of a park, stretched across three blocks of steps and gardens on Russian Hill. The view makes the steep climb worth it. * Tu Lan: This little Vietnamese hole-in-the-wall restaurant is much loved by locals, and despite the grotty surroundings it will have you dreaming of imperial rolls. * Molinari: At this North Beach institution, grab a roll from the basket and let the cheerful Italians fill it with juicy salami and cheeses from the counter. * Insider tip: It is always ‘San Francisco’ or ‘The City’. Do not call it ‘San Fran’, and whatever you do, never call it ‘Frisco’! Posted on 06/06/2012 by Jess. 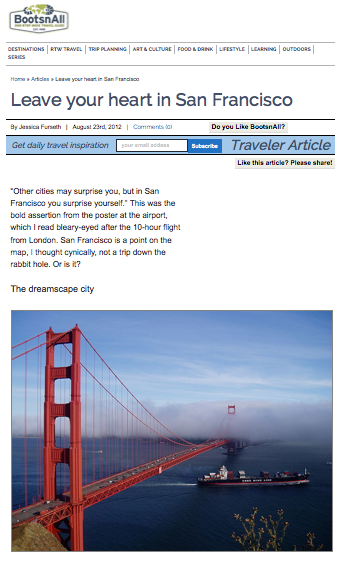 This entry was posted in Travel writing. Bookmark the permalink.